It’s 4:05 on a bitterly cold Wednesday afternoon in February, and a small line of students waits outside a one-car garage on East 19th Street. Warmed by a carafe of free coffee, they have lined up, ID cards in hand, to pick up food from the Student Food Pantry. After checking in, student volunteers help each person choose from the staples that line the shelves: canned fruits and vegetables, pasta, grains and a limited selection of refrigerated and frozen goods. Hungry students leave with a bag of food that will get them through the next few days and hopefully allow them to focus on their studies free from worry about where their next meal will come from. Student hunger has received national attention lately, with a story in the New York Times last month reporting that almost half of all college students across the United States experience food insecurity. At the UO, the food pantry serves approximately 150 students per week, according to Doug Hale, director of the Episcopal Campus Ministry, which runs the pantry out of its building just south of campus. Nowadays, the pantry is open two days a week for two hours at a time and receives the lion’s share of its food from Food for Lane County, which will receive most of the UO’s donations during this month’s Governor’s State Employees Food Drive. 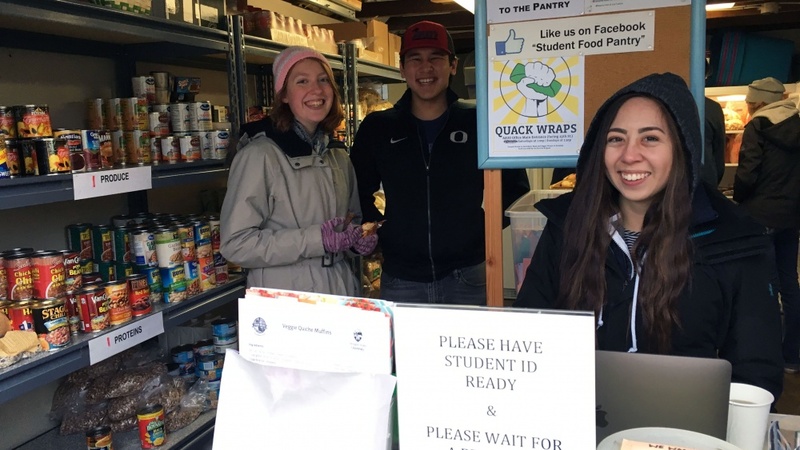 UO junior Anna Yee volunteers at the food pantry because she wants to aid her fellow students. The food pantry isn’t the only way students are helping their peers who don’t have enough to eat. A UO Food Security Task Force also is working to identify resources and arrange support for hungry students. Led by student body President Amy Schenk, representatives from the Associated Students of the University of Oregon and units like student life, the Erb Memorial Union and academic advising meet monthly to discuss how best to align limited resources to meet the needs of students. Discussions are underway on how to expand the food pantry’s space or provide other types of support to students on the UO campus who experience food insecurity. “There’s a lot more need out there than what we are able to handle at this point,” Hale said.